PDXCUG is active in developing projects for the Commodore community. Our members meet regularly and work on these projects as time permits. Projects can be any Commodore-related project, such as hardware, software, documentation, or just about anything else that might come up! Feel free to leave us some feedback on this project or if you have another idea for a future project. The group had a meeting and while playing games, realized it is a pain to switch joystick ports on the back of an SX-64. That got us talking about how annoying it is to switch ports every time you wish to play a game - you never know which port to use. The group decided to design a joystick port switch that would plug into both port 1 and port 2 at the same time and simply throw a switch to swap ports. The device would still work for 2 joysticks plugged in at the same time, but the switch determines which joystick is in port 1 and which is in port 2. 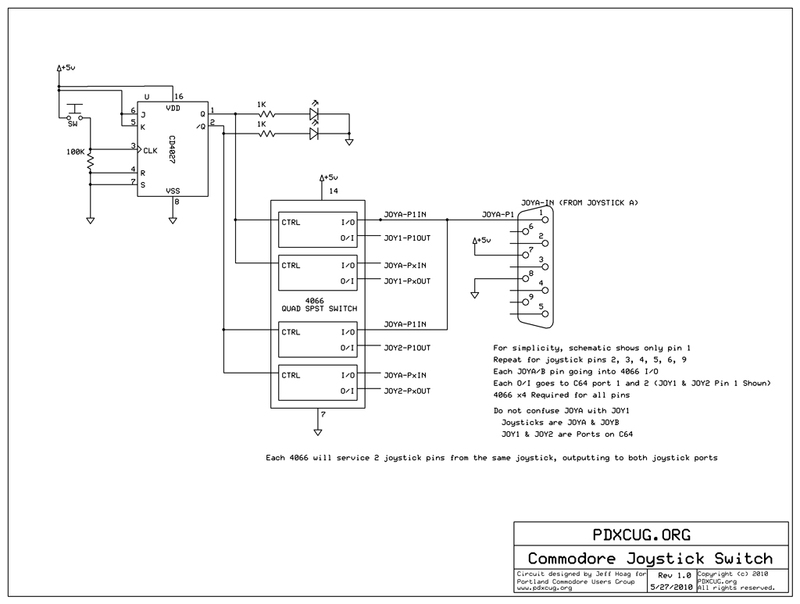 PDXCUG plans on designing, manufacturing and selling this device to the Commodore community at a reasonable price (yet to be determined). Proceeds from your future purchase will go toward other club projects and activities. Research completed by GeekWithSocialSkills - there is no existing project like this, according to him. Prototyping party was a huge success at the August 12 PDXCUG Meeting. See the August 12 Meeting Highlights for more information. Superb idea! Put me down for one, please. Post your comments here - we'd love to hear from you! *Name, and comment are required.